According to Apple's System Status Page, some users are unable to access the App Store, iTunes Store, Mac App Store, and iBooks Store. iTunes Match, iTunes Radio, and iTunes in the Cloud also appear to be experiencing issues. App Store users were also seeing problems accessing apps on Tuesday, making this the second outage the sore has seen this week. Problems appear to have began at approximately 1:30 PM Pacific Time, and are ongoing. Apple does not say how many users are affected by the outage, but there are multiple reports of problems on Twitter and other social networking sites. Some users are not experiencing any issues, however, and appear to be able to access all services without a problem. 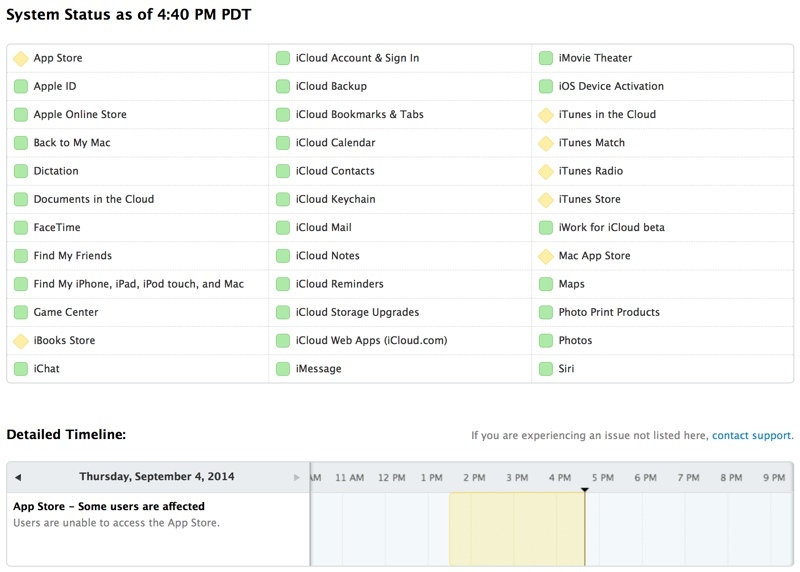 Update 5:40 PM PT: Apple's System Status page suggests the outage is now over. Sadly iTunes Radio has been down for european users since ever. iTunes match still doesn't work regardless of what the status page says.